Bizen uses a unique process to extract active ingredients from garlic in odorless forms. One such active ingredient in garlic is alliin, which is converted to allicin (which gives garlic its characteristic strong odor) during processing or cooking. 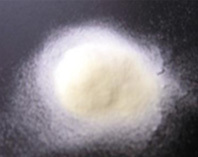 However, at Bizen we are able to extract the active ingredient as alliin, and provide an odor-free garlic extract powder. 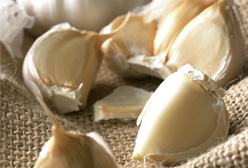 Since ancient times, garlic has been thought to have anti-fatigue properties. Rats given Garlic Extract Powder had significantly accelerated recovery from Physical fatigue compared to control rats. These results suggest anti-fatigue properties of Garlic Extract Powder has. Garlic Extract Powder has been shown to have blood clot prevention properties in both in vivo and in vitro studies. The production and dissolution of blood clots are necessary processes for the repair of intravascular spaces. However, for many people today, it is easier for blood clots to form and more difficult to for them to dissolve which greatly increases the risk of thrombosis. Tests on catheterized rats have shown that rats treated with Garlic Extract Powder maintained normal clotting function compared to control rats. In an artificial blood clot model, experiment Garlic Extract Powder was found to promote the dissolution of blood clots. These findings suggest blood clot prevention properties of Garlic Extract Powder. In addition, the results of a test using an artificial blood clot model indicate that blood clot dissolution is promoted in the presence of Garlic Extract Powder. These findings suggest that Garlic Extract Powder has a blood clot prevention effect. Bizen Active Garlic Extract Powder(Japan) is made from "Fukuchi white 6-cloved garlic" grown on the rich land of Aomori Prefecture, producing a safer, more reliable product.